How are the next generation of England cricketers going to get the experience they need now that the Home Office has brought in legislation that targets Kolpak players? How will young South Africans get the necessary experience of English conditions to help them earn their place in the Test side? How will they even qualify for the national side if it’s going to be made so difficult for counties to sign them in the first place? 20/20 for $20million – what is that in pounds? It’s a secrey plan by CSA to keep South Africans where they belong. South African sympathising administrators have clearly in filtrated the ECB, much in the way the players have infiltrated the team. They’re bringing England down from the inside. I noticed that Somerset have signed Nick Compton – who was born and educated in South Africa with English parents. However, would anyone mind if he played for England: he is, after all Denis Compton’s grandson? Of course he can play for England. It shows the curious position England is in. Loads of potential players are born abroad to British parents. Strauss is OK because he came over young; Peitersen did not and is therefore dodgy. But I feel a bit arbitrary making these judgments. Pietersen’s mum’s British, but that’s not really our point, so we don’t know why we’re saying it. Every case is different and everybody will look at each case differently on top of that. It’s a big morass of greyness and there are no right or wrong answers. We say if a player wants to play for England and they can be arsed meeting the selection criteria (whatever that might entail) then good luck to them. I think we are all a bit hypocritical in England, we all love seeing Kevin Pietersen score a century but are still unsure as to whether or not he should be in the team, the situation with his Mother being British makes his case a bit more complicated. For Strauss it’s simple, he came here as a youngster and probably had no say in the matter. Where I have a problem with it all is when a bloke decides he is going to pack his bags and come to England to play test cricket, probably because he thinks it’s easier to get into the England team than the South African one. If you end up in England for circumstances beyond your control and are brought up here I don’t have a problem with it. When you are making a calculated decision to come to England and play the system is where I have the problem. There is nothing illegal about it, the law is just wrong. I’m glad it is being changed as I don’t want an England (or a South African 2nd eleven) team made up of Kolpak players. 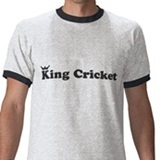 A new recurring King Cricket feature!